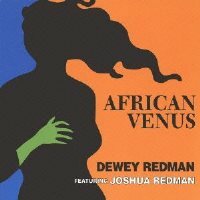 Description: This 1992 recording by saxophionist Dewey Redman is special in many ways. While certainly known, he was not necessarily a household name to Japanese jazz fans, so it was a bit of a surprise when the Japanese label Venus Records released his new recording. Secondly, his son and tenor sax player, Joshua Redman, joined him on three tracks ("Venus And Mars," "Mr. Sandman" and "Satin Doll"). At the time of the recording, Joshua had just come on to the scene and was making big waves. The title track is a very exciting, exotic number featuring Dewey's musette and percussionist Danny Sadownick. Other highlights of course include the father-and-son collaborations on three tracks. It is interesting to note that Redman senior is wilder and "freer" than Joshua who sounds more traditional and contained in comparison. Recorded at Sound on Sound Studio in New York City, on December 11, 1992. Gate-fold paper sleeve edition.